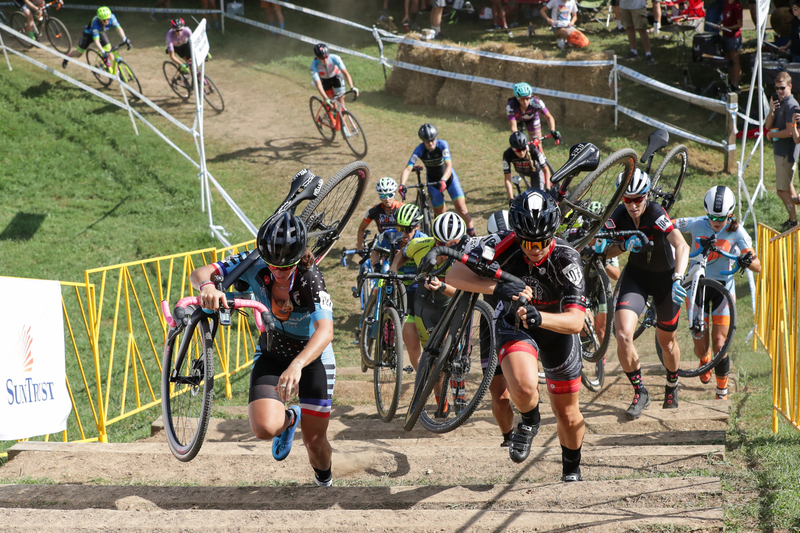 In cyclocross, the sprint is at the start. Get ready. Roll to the line. Wait for the signal. In an instant, it’s full gas. It’s chaotic. It’s a fight to establish position and get settled in for some hard tempo. 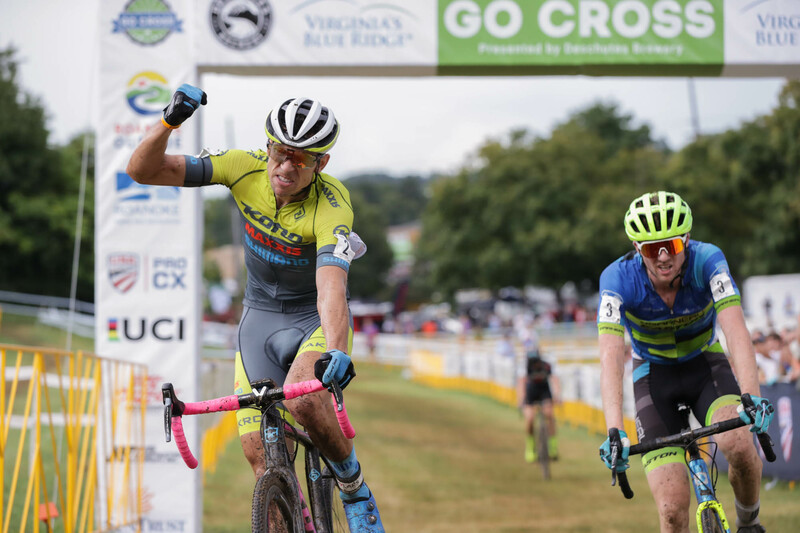 Bill and I are at GO Cross in Roanoke, Va., for the opening weekend of UCI racing in the U.S. It’s our first good look at the elite fields heading into the 2018 season. This is also our first time at the GO Cross venue, so we arrive early for some recon. We need to be ready. ‘Cross is coming. And when it starts, we will be sprinting. Race organizers have carved a tightly packed layout into Fallon Park. A mix of long straightaways and tight corners twist back and forth over gentle elevations with some off-camber stretches. There’s just enough tech in it to test racers skills, especially at high speeds. There’s a wooded climb, a set of stairs, an uphill-downhill log section, a 100-ft-long sand pit and a flyover. There was initially a set of barriers on course, until UCI commissaires elected to pull them. Not a big loss, though. There’s plenty going on here without adding a couple of planks. 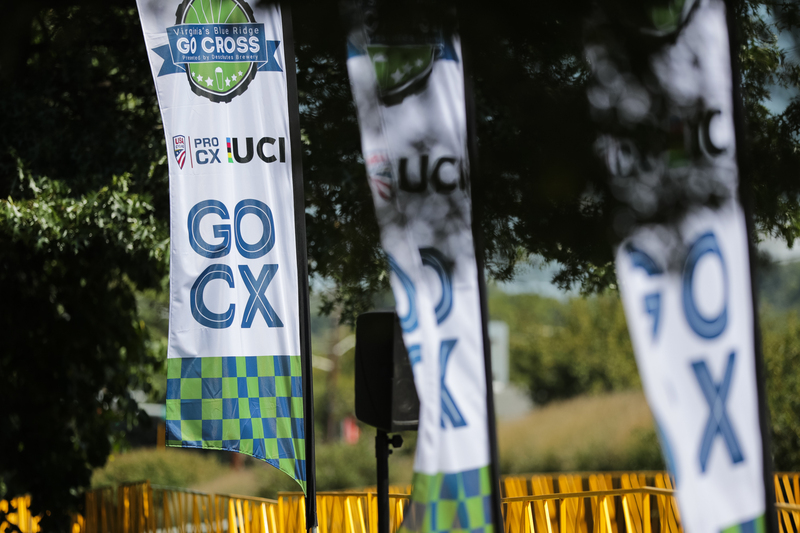 The layout allows spectators expansive views of large portions of the course from various points in the park. That’s good news for us, too. We can see where racers are and know where we need to be next. 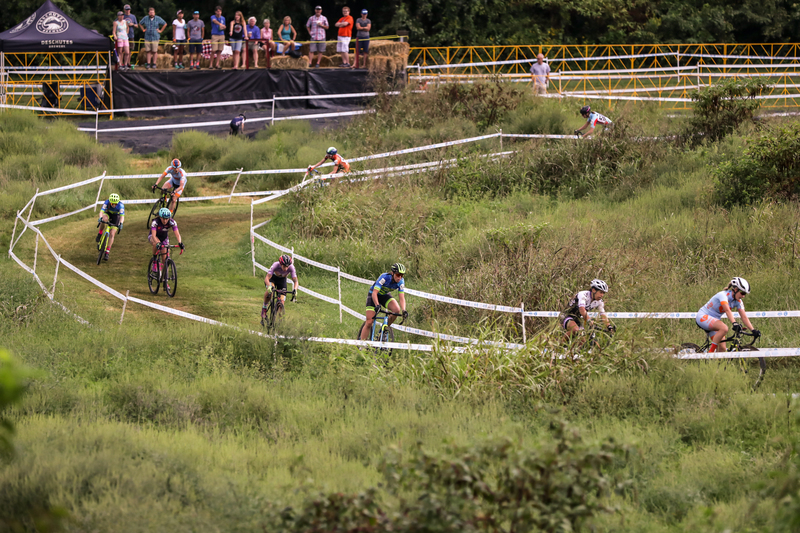 An impressive field of elites has made the journey to Virginia’s Blue Ridge. The 2017 men’s and women’s Pro CX winners, Tobin Ortenblad (Donkey Label/Santa Cruz) and Caroline Mani (Van Dessel), are here. West coasters Crystal Anthony (LIV Cycling), Cody Kaiser (Lange Twins/Specialize), Troy Wells (Team CLIF Bar) and Caroline Nolan (Voler/Clif/Rock Lobster) traveled cross country to be here, too. 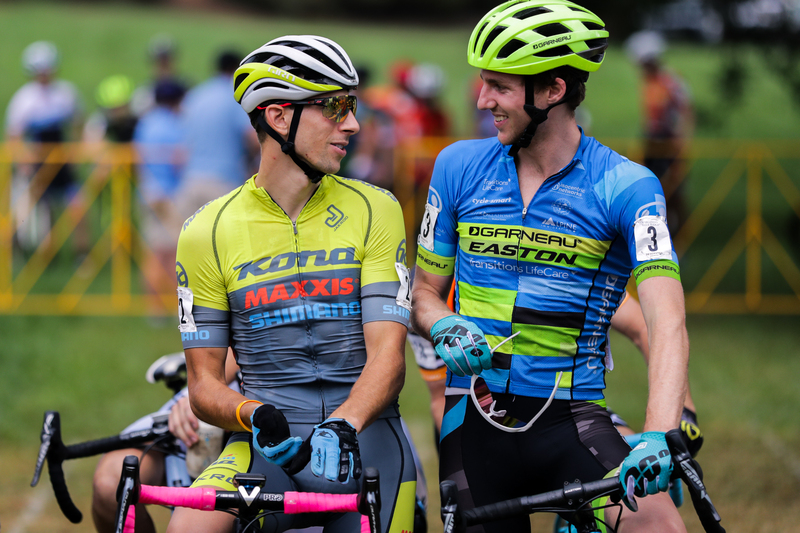 It’s a hot and sticky summer day in Virginia, and Carolina boys Kerry Werner (Kona), Eric Thompson (M Speed Wax) and Tristan Cowie (CTS Cycling Team) know how to suffer under these stifling conditions. But, as has been the case all summer in the mid-Atlantic, a storm is building. The cloud cover provides brief relief from the solar blast that baked the venue through the morning. Then it begins to sprinkle. Then it thunders. Then it rains. Then it pours. Pre-start rituals are interrupted by debates about tire choices. What started as a file-tread day has entered mid-block territory. 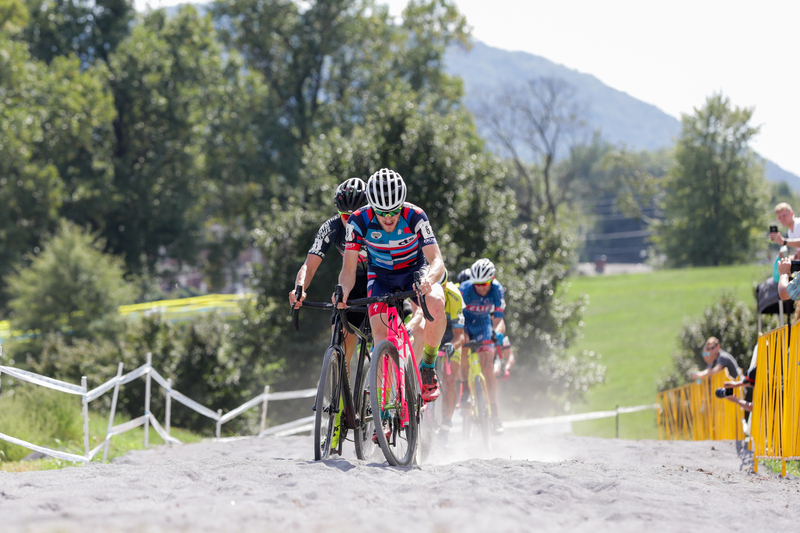 At GO Cross, women not only get their entry fees covered by sponsor East Coasters Bike Shops, they also get top billing. The men will line up first and face the freshly drenched track. Racers hit the line. Some, like Werner, are trying to keep it loose. Ortenblad appears focused, and maybe a touch anxious about wearing the #1 bib on his shoulders. 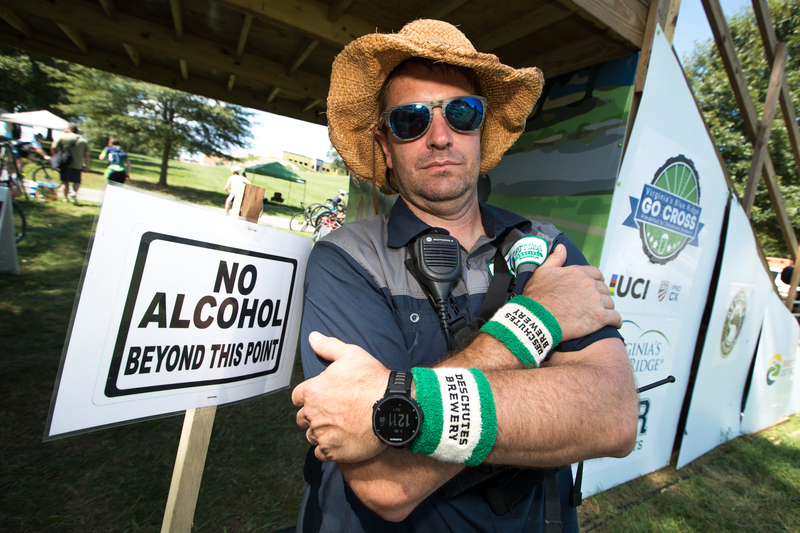 Belgian Yorben Van Tichelt (Neon Velo), who is in the U.S. with the goal of stocking up on UCI points, is either bored or fighting off a nap. 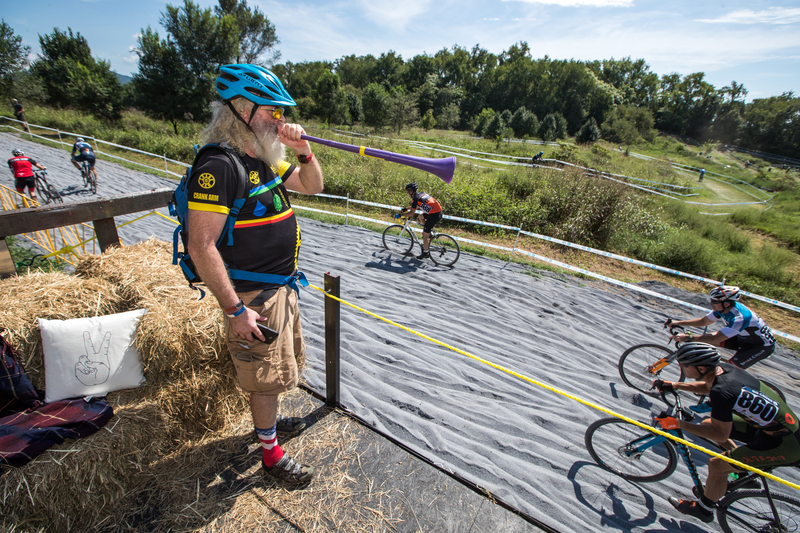 Maybe Appalachian cyclocross ain’t his thing. The official gives his final signal and a brief moment later, the 2018 season is rolling down the starting straight at full gas. From the gun, Cowie hits the holeshot. He won this race last year. 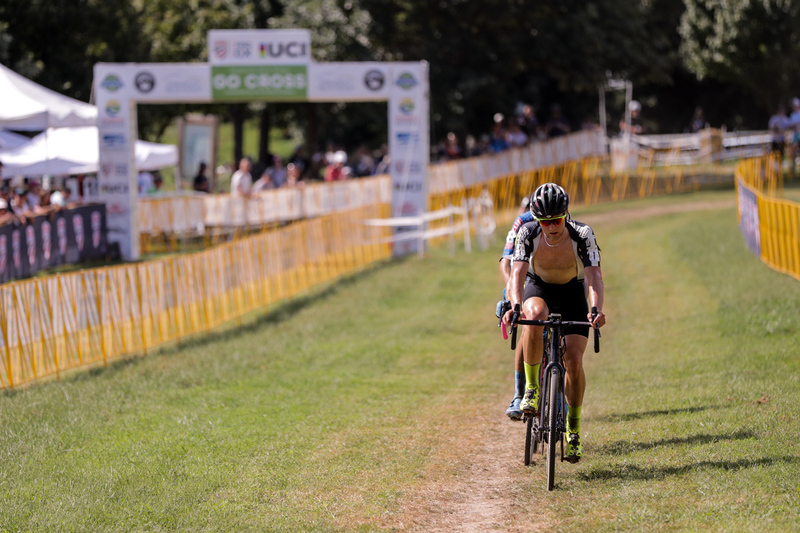 He knows he needs to gain position early, if he plans to be among the leaders at the finish. The pack rolls across the flats toward the steps. We need to catch them. We’re sprinting. We cross over the hill that separates the front section of the course from the back. 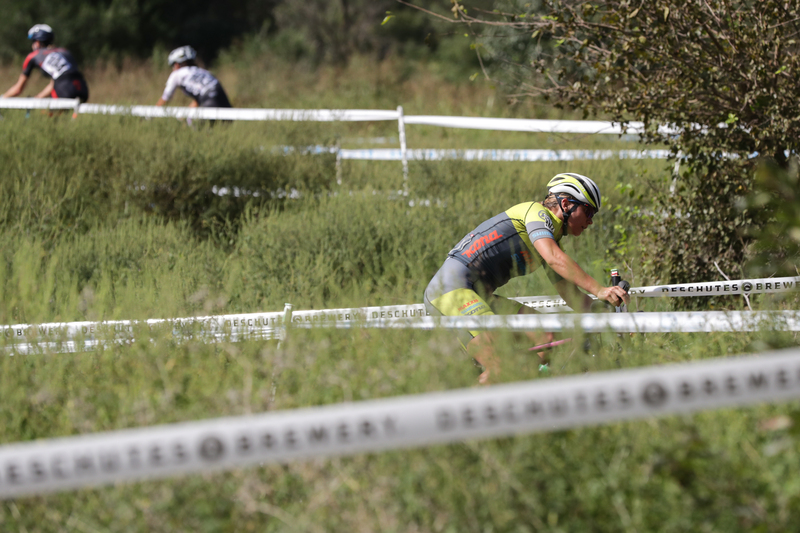 The pack has already navigated most of the high grass- and brush-lined sections of the course. They dip behind a stand of trees and pop out at a series of three logs set across a short downhill, followed by a 180-degree turn and a set of three more logs on an uphill. Tire pressure and tread choice are critical here. No one can afford to spin out and lose places. The race heads over to the back section and when it returns, a selection is already starting to form. This is the moment where preseason predictions get buried and reality rises to full view. Who is coming into the season with good form? Who is lacking? Who is most improved? Who is falling behind? 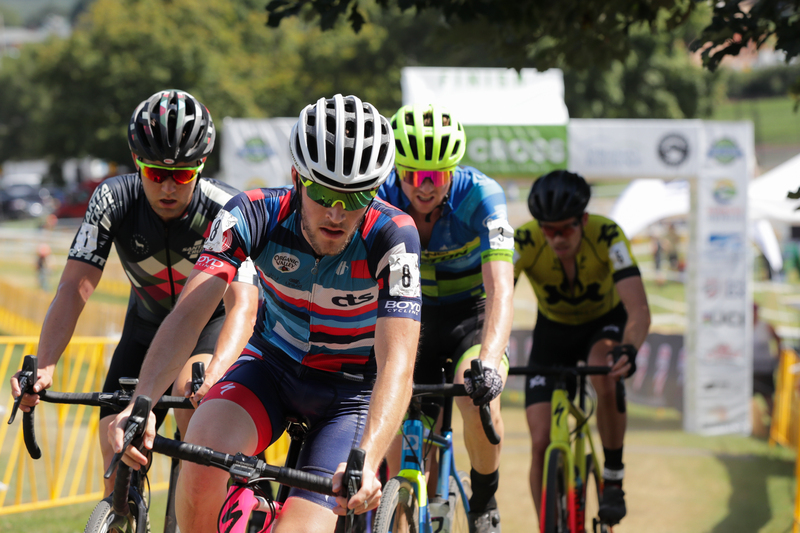 Ortenblad, Werner and Jack Kisseberth (Garneau-Easton) are making good on high expectations, trading positions at the front as the laps wear on. Cowie hangs on for most of the race, but eventually loses the pace and has to back off. 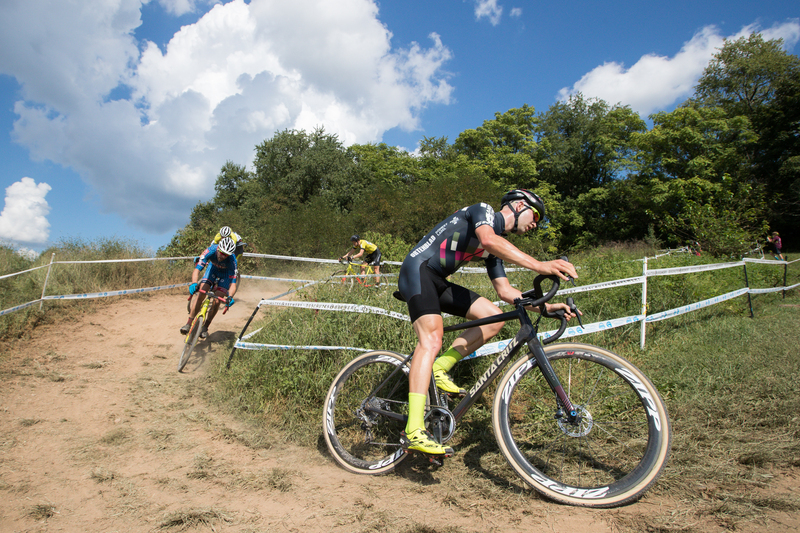 He finished last season with a 7th place finish at Nationals that earned him a spot on the Worlds team. Maybe he’s not in that kind of form yet, but it’s September. This is the start of the season. We’re sprinting into it. There’s a long way to go. Werner and Kisseberth appear on similar form. Kisseberth wants to deliver a result for his new team. Werner has a lot of motivation to move up the ranks after finishing on the podium at Nats in Reno. Ortenblad looks like he is digging deep. Very deep. He’s coming into the season with a different approach to training than last year. His top form will likely come later. A high finish today could signal that bigger gains are on the horizon. 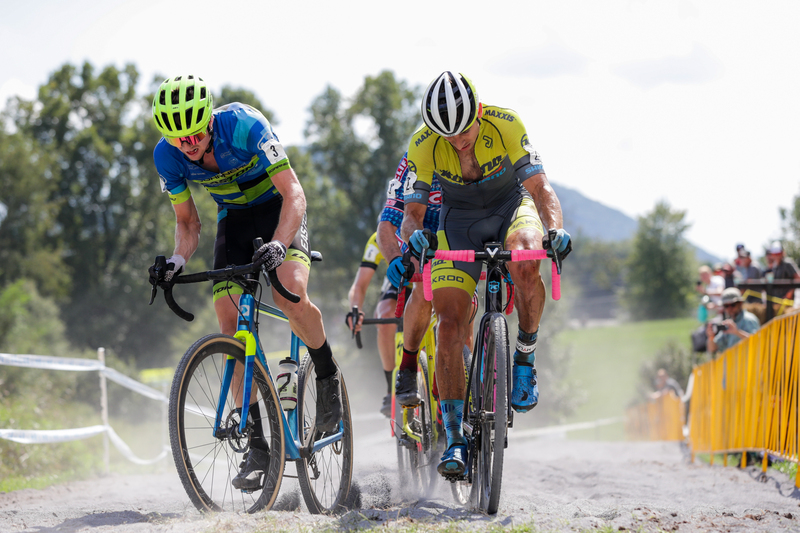 From racing against Ortenblad last year, Werner and Kisseberth both know they don’t want to go toe-to-toe with him in a sprint. On the final lap, Werner makes a big move on the back section near the woods, where he knows Ortenblad has struggled a bit. Werner gets the jump on him and Kisseberth sticks with it. Ortenblad digs deep to hang on, but he can’t quite regain position. As they make the final turn, Ortenblad is too far back. Kisseberth and Werner are side by side. Forget what I said before; I was wrong. 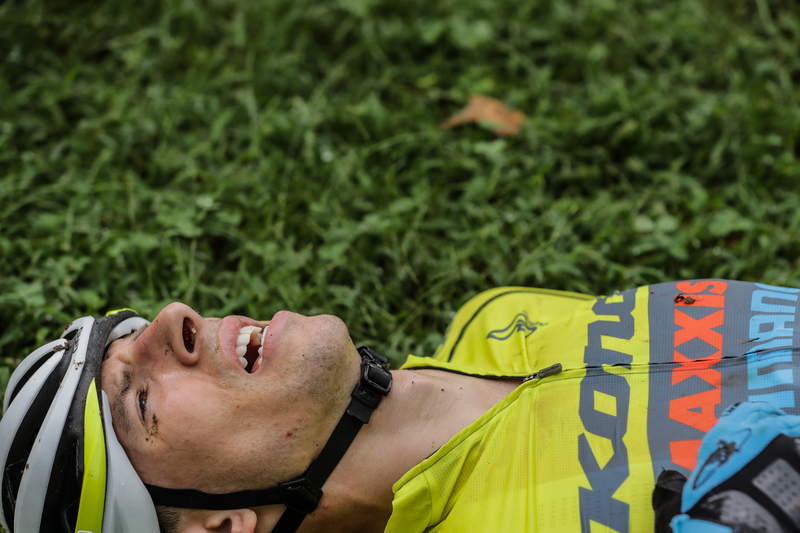 Sometimes the sprint is at the end, too. It’s the first race of the season and it’s come down to a dead-even charge to the finish. As they lunge for the line, Werner gets it by less than a wheel. The timer calls the gap at 9/100ths of a second. 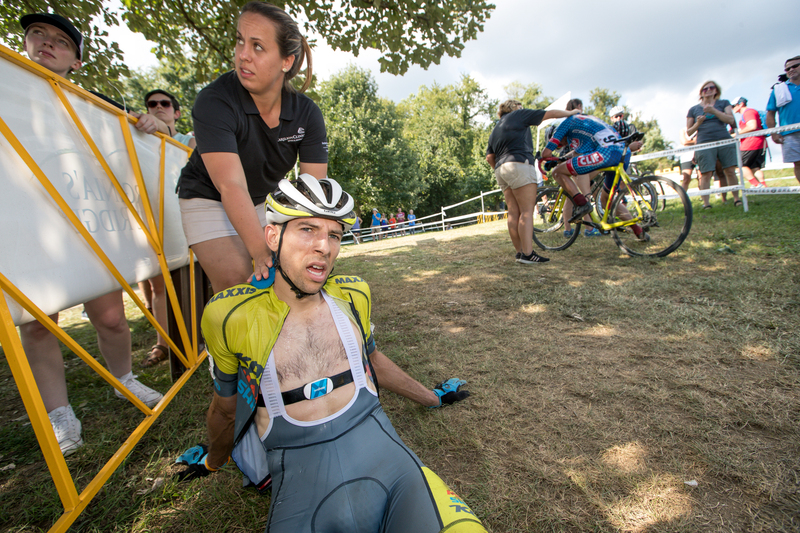 It’s time for post-race interviews and images of riders who are completely gutted from the effort. They spent the last 60 minutes testing their fitness, their skills and their pain thresholds. Words don’t come easily. Thoughts are jumbled. The women’s race is about to start over on the backside of the course. We’re sprinting. 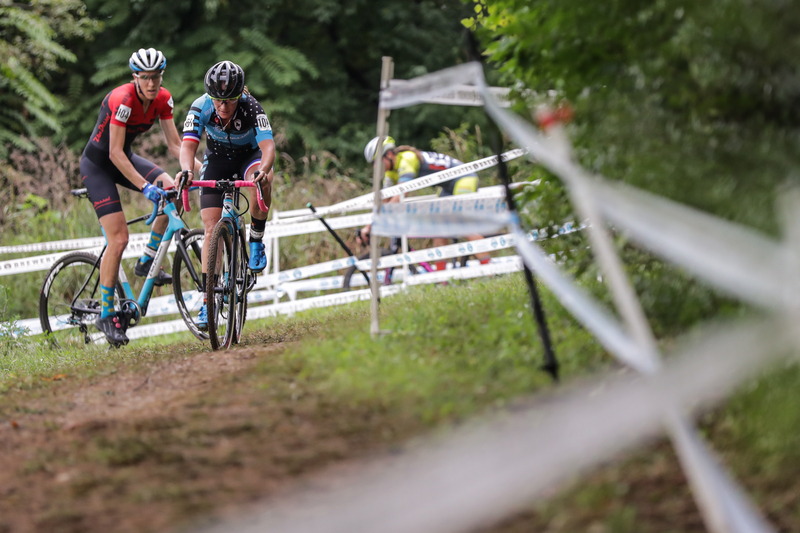 Allison Arensman (JA King) gets the holeshot and drags a stacked women’s field around the course for nearly a lap. The favorites begin to take over the front. 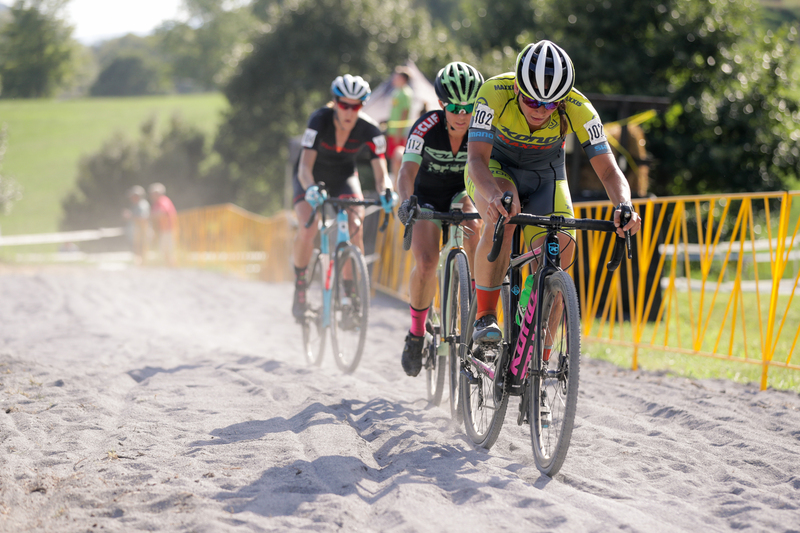 Mani and her teammate Sunny Gilbert (Van Dessel) are there, along with Rebecca Fahringer (Kona), Nolan and local favorite Carla Williams (Deschutes Brewery). Missing from the early mix is Crystal Anthony. She came out of both pedals at the start and had to chase down the entire field. Within a couple of laps, she’s in contact with the head of the pack, but is paying for all of that effort. She will have to sit in. 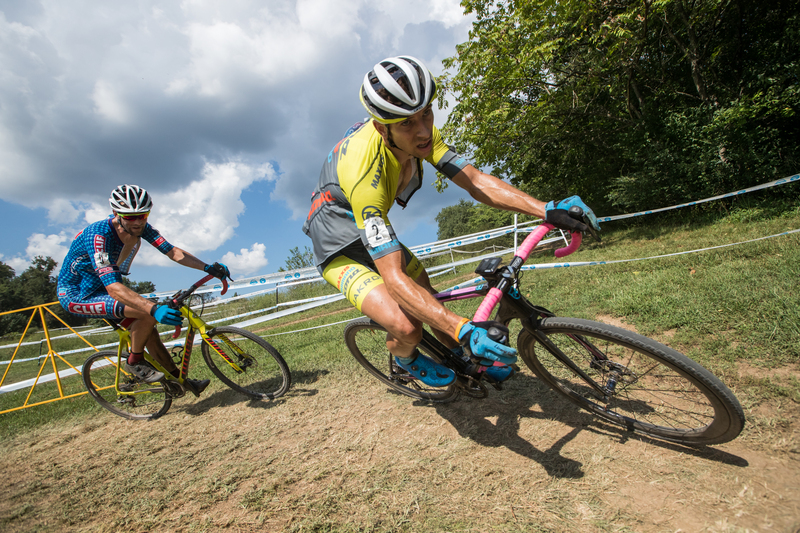 As the only teammates at the front, Gilbert and Mani see a chance to deliver a one-two blow to the competition. Gilbert goes first. The rest of the pack chases. Mani makes her move and the two are both off the front. The gap is growing. The chase is faltering. 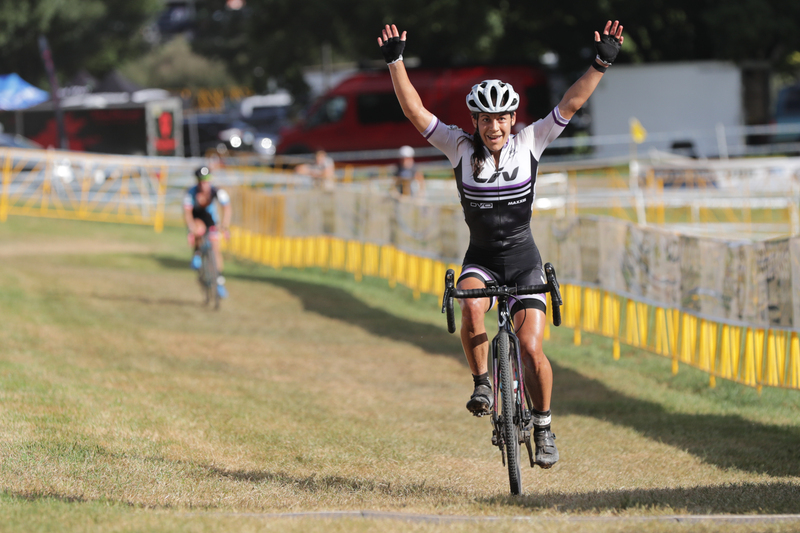 Fahringer decides to pursue the podium on her own. Like Kisseberth, she wants to deliver for her new team. After Werner’s win, adding a podium in the women’s race would be a fantastic start to the season for the team. 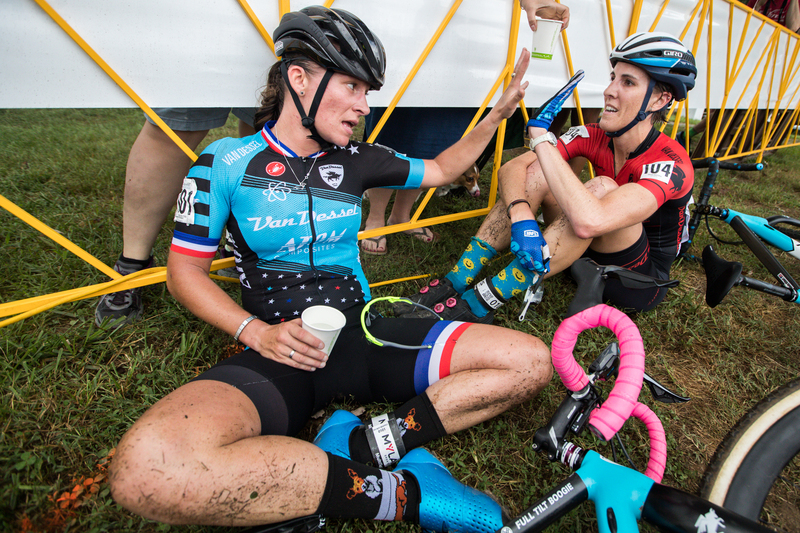 The Van Dessel teammates seem poised to roll to the finish together. But Gilbert slides out in a slick corner and bends her derailleur hanger. She’s able to get back to the pits and grab a spare bike before Fahringer can catch her. But Mani is gone. Victory is inevitable. Behind, Anthony has been sitting on in the chase group. She’s recovered just enough to make a big move on the final lap. She jumps and soon closes in on Fahringer. She claims what will be the final spot on the podium just a Mani makes her final turn toward the finish. It’s third place, but a small victory for Anthony after her start line mishap. More interviews. More quotes. More images. Racers are headed back to their team tents to pack up and head off to start their recovery. Our work delivering content is just beginning. It will be a long night, but it still feels like we’re sprinting. The next day, swampy weather is back. The heat index is above 100F. Slick conditions quickly burn off in the morning sun. By midday, the track is already getting dusty. File treads are back in favor. You don’t need to sprint to sweat in these conditions. After a bit of recon, I’m already soaked and may need to settle into a manageable tempo pace to cover today’s races. The men’s start is a close copy of the previous day with Cowie taking the hole shot. Notably, Werner falters and gets caught in midpack traffic. Trying to make up places on the first lap, he gets pinched in a corner, then hip-checked. He hits the ground. His bike flies into the tape. Like Anthony did on Saturday, he is now chasing hard to get back with the leaders. After a hard first lap in intense heat, the lead selection starts to form. The race settles back a touch. It’s enough for Werner to make the junction. The course is running fast and treads hook up well. A large group of riders works the front, including Werner, Ortenblad, Cowie, Thompson, Wells and Kaiser. Kisseberth is there at first, but he flats and has to spend the remainder of the race chasing. Ortenblad launches a series of attacks to soften up the field. The group shatters and comes back together multiple times. Werner mostly keeps in contact. The heat is taking a heavy toll on me. I can only image what the racers are going through. Fortunately, at this point in the weekend, I’ve figured out the most efficient routes around the venue. Shortcuts through the brush are getting worn in. In the waning laps, Werner and Ortenblad get away and only Wells can hunt them down. Rather than ease up, he decides to drive the pace. Wells is determined to make this the final selection. Kaiser is closing but with the last lap approaching, he has no time to settle in before the final push to the line. Ortenblad knows Werner will want to make his move in the back section again. He’s ready for it. He holds position. Werner makes a last-ditch effort and charges past Ortenblad up the stairs. He gets the gap and holds it through the final turns. After a monstrous effort to come back from his crash, Werner closes out the weekend with double wins. The women are queuing up for the final race of the weekend. I’ve stopped sweating. This isn’t good. Gotta settle back into an easy pace. No more sprinting. 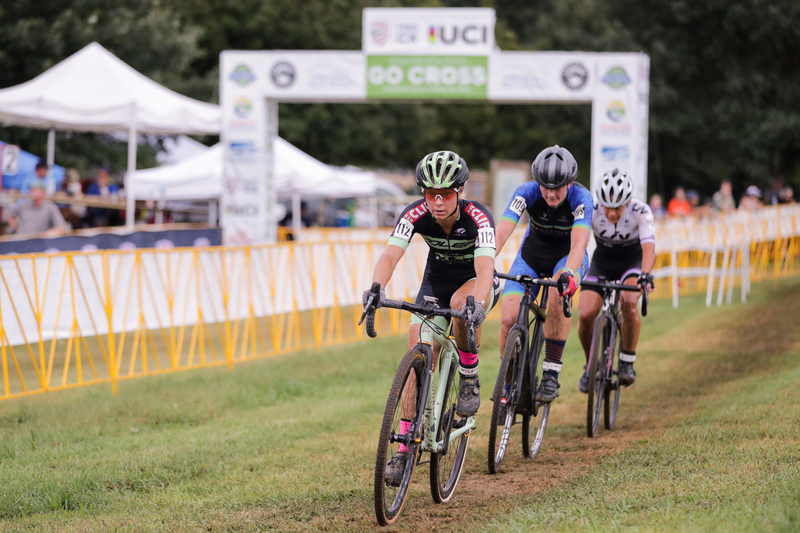 The women’s start is another repeat from Saturday with Arensman taking the holeshot. 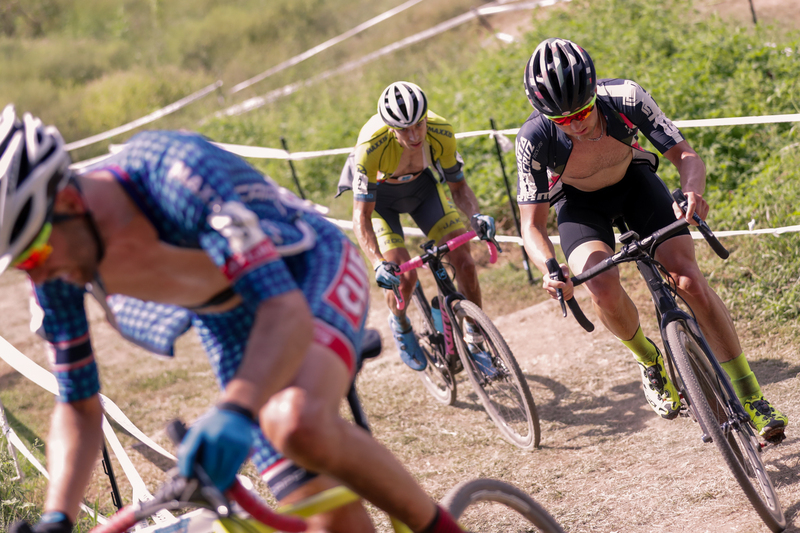 Within a few laps, the same lead pack has formed—Anthony, Mani, Gilbert, Nolan, Fahringer and Williams. This time, however, Anthony is there from beginning. She hasn’t expended any more energy than needed. She settles in and tries to maintain a manageable pace. The heat is severe. Don’t sprint. Before the elite races, the sand pit got a bit of grooming. Add in the dry and dusty conditions and the sand is particularly loose today. Most women choose to run it. Anthony continues to throw down a steady hard tempo. Riders start to crack. Only Gilbert can keep pace. With two laps to go, Anthony decides to test her luck in the sand. Gilbert runs. 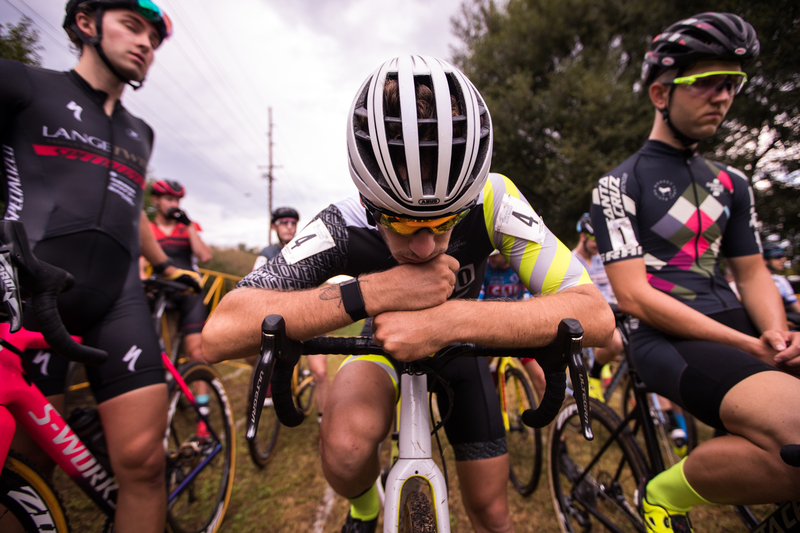 Anthony rides and is able to gap the Van Dessel rider. Anthony is on her own to the finish. It’s up to the chasers to close it down. As the racers head to the back section for a final time, I ready myself for the finish. Words don’t come easily. Thoughts are jumbled. I walk to the medical tent and grab an ice water-soaked sponge. I lean over and squeeze it to the back of my neck. It’s like a shot of adrenaline hitting the vein. I snap back to reality. Winners are coming. I need to be at the finish. I’m sprinting again. Mani made a late move to overtake Gilbert, but it’s not quite enough to catch the leader. Anthony closes out the weekend with another podium finish and a boost of confidence from knowing that her fitness is on track. 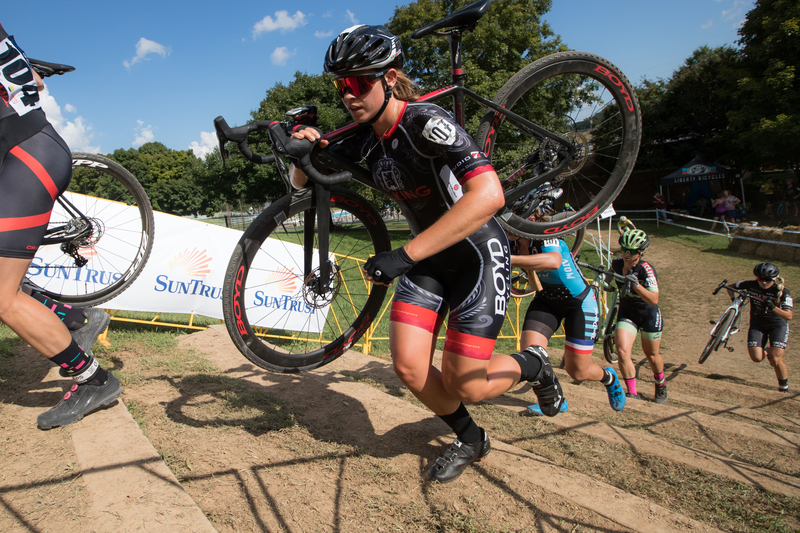 She’s looking strong heading into the season’s first C1 race next weekend in Rochester. But well before next weekend comes, we have a lot of content to push. So much to go through. Not much time.